Bad Posture Isn't Just Ugly...It's a Syndrome. You may be asking yourself, WHAT THE HECK IS UPPER CROSSED SYNDROME?? Well, I am here to tell you. 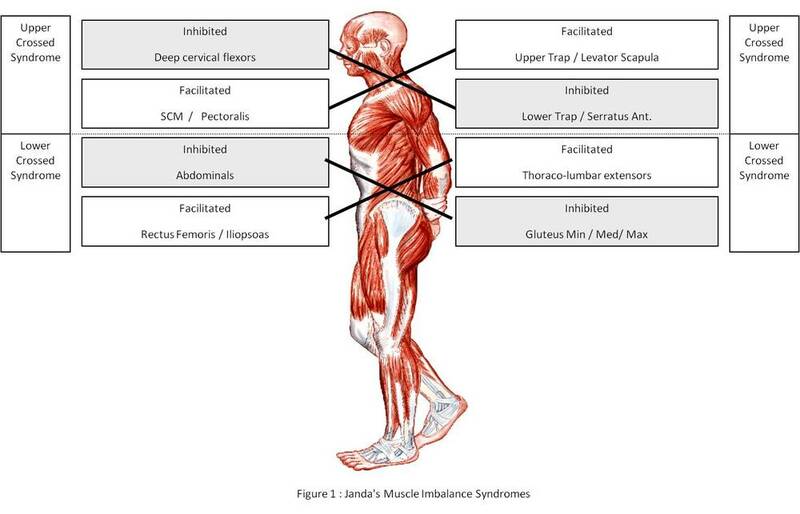 Upper crossed syndrome refers to postural and muscular imbalances caused by certain muscles being facilitated (activated) while others are inhibited (lazy) leading to slumped forward, not-so-attractive posture. What does upper crossed syndrome look like? If you were to look around any office you will likely be able to spot at least one case of this syndrome. Basically, slouched posture, rounded back with chin jutting forward. While this is obviously not an attractive look, the implications go far beyond appearance. This "condition" mostly affects those who sit for long periods of time at a desk or in a car. When one gets lazy with their posture and gradually assumes the above described position a few things begin to happen. From the top down: the muscles in the back of your head and neck become overworked, trying to keep your eyes on the horizon because of your rounded shoulders and jutting chin. This can lead to tension headaches you feel at the base of your skull and into your temples. Your scapular (shoulder blade) muscles responsible for pulling your shoulders back into their proper position go into hibernation mode and are then unable to combat the effects of your tight pectoral muscles, which pull you further forward. So what? When you assume this posture described above, the normal curves of the spine are altered. The curve in your neck straightens and the curve in your mid-back becomes exaggerated. When this occurs the joints don't wear evenly and wear and tear is accelerated. This can lead to pain and early onset of arthritis in the spine. If you suspect you are afflicted with this syndrome, there's hope! Dr. Pierce used chiropractic care to restore joint mobility to the spine, muscle release to relax tight muscles and exercise to strengthen and correct the problem long-term. If addressed early, you can avoid the painful and debilitating effects of upper-crossed syndrome! To make your appointment call (949)300-2028 or book online today!